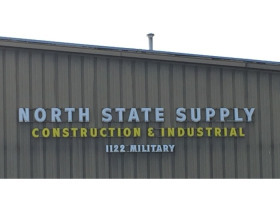 North State Supply Liquidation ~ Live Auction | Moyer Auction & Estate Co., Inc.
~ FORKLIFTS ~ NEW TOOLS ~ NEW HARDWARE OF ALL SORTS ~ SHELVING ~ OFFICE ~ SUPPORT EQUIPMENT ~ MORE! 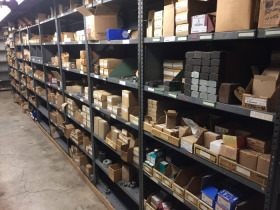 INVENTORY including Power tools by Milwaukee, DeWalt, Metabo, Ridgid, etc. 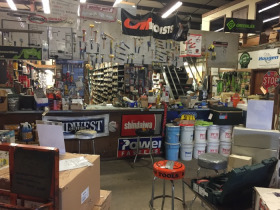 ; Hand tools by Klein, Ridgid, Greenlee, Estwing, Midwest, Proto & others; Nicholson files; Weather Guard truck boxes & van racks; Knack & Greenlee storage boxes; Louisville fiberglass & wood step & extension ladders up to 36ft. 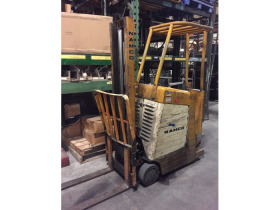 ; Jackson, Union, Razorback & True Temper shovels, forks, rakes; wheelbarrows; JET pallet stacker; Wheeler-Rex 6.5hp hydrostatic test pump; steel stock; key stock; threaded rod incl. 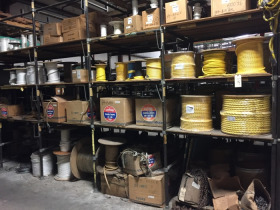 stainless; cable; slings; 1,000+feet of chain; chain binders; bolt cutters; CM chain hoists; Jet trolleys; Wilton vises; spools of poly & manilla rope; hose; brass & bronze fittings & valves; diamond saw blades; abrasive disks & wheels; rubber & hydraulic hose; hyd. 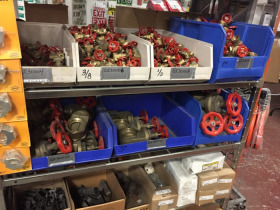 hose fittings; DeWalt & Roto-hammer drills & chisel bits; hard hats; safety glasses; rain suits; coveralls; gloves; rubber boots; safety harnesses; tool belts; Igloo drink & chest coolers; shop vac; electrical cords; work lights; nuts/bolts & hardware of all grades, sizes & materials; fittings & fasteners of all types; 20T capacity crane hooks; and much more!!! 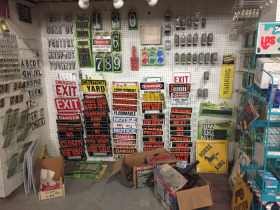 Large lots for jobbers/resellers as well as singles for individuals.  OFFICES & BREAKROOM: Free-standing modular 8x12ft. "in-plant" office with air conditioner; desks; chairs; many 4dr. & 2dr. file cabinets; 2 fireproof 4dr. file cabinets w/keys: FireKing & Victor; storage cabinets; Mosler safe; shelving; Amano digital time clock; Ricoh copier; Wyse computer terminals; Oki printers; break room table w/benches; waste cans; GE refrigerator; etc. 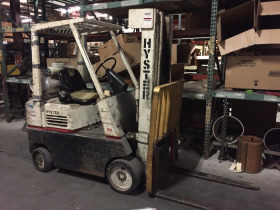 SUPPORT EQUIPMENT & RACKING: Selling at 11:00am - Hyster S50E LP forklift, 5,000# capacity (remains onsite until 10/8); Namco LC-2020L LP aisle forklift, 2,000# capacity; pallet jacks; 5hp vertical air compressor; rolling stairs; carts; dollies; torpedo heaters; Oster Rapiduction 792-A power pipe threader; lg. Oster 326 power pipe threader; Oster thread dies; power bender; sm. 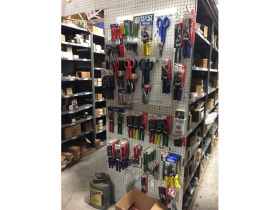 power threader; Weatherhead hydraulic hose crimping tool w/many collets/dies; lg. 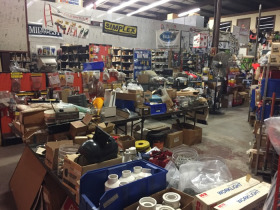 Wells metal bandsaw; mig welder; old stick welder; bench grinder on stand; support stands; Dewalt cutoff saw; box stapler; workbenches; tables; shelving; box stapler; package tape dispensers; pallet racking; pipe rack; bolt bins; push mower; assorted hand tools; metal scrap; etc. Preview from 8:30am. Auction begins promptly at 10am, second auction team begins selling at 11am, 2 auctions selling simultaneously until all is sold. TERMS: Payment in full by Cash, NY check, Visa/MC. 10% buyers premium. NYS Sales tax as required unless exempt. Preview: 8:30am. Removal time: Thursday immediately following auction, Friday 9:30-4:30 & Saturday 9:30-4:30.